Dr. John V. Hegde is an Assistant Professor in the Department of Radiation Oncology at the David Geffen School of Medicine at UCLA. He attended Indiana University for his undergraduate studies, earning dual bachelor of science degrees with highest distinction in biochemistry and biology. He received his medical degree from Harvard Medical School, and he completed his residency training in radiation oncology at UCLA. His research interests include the clinical evaluation of novel multidisciplinary cancer treatments incorporating radiotherapy and the utilization of state-of-the-art imaging methods to improve cancer care. He has co-authored more than 25 peer-reviewed manuscripts, and during residency, he was the lead author of more than 10 research articles in notable journals such as Cancer and the International Journal of Radiation Oncology, Biology, Physics, the premier radiation oncology journal. Dr. Hegde has specialty training in radiotherapy for all anatomic sites, with a specific focus on breast cancer and malignancies involving the central nervous system. 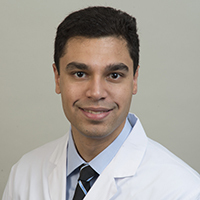 He has experience in advanced radiotherapy techniques, including stereotactic radiosurgery (SRS), stereotactic body radiotherapy/stereotactic ablative radiotherapy (SBRT/SABR), intensity-modulated radiotherapy (IMRT), and the integration of innovative image-guidance platforms for these treatments. Research interests include radiotherapy and its applications to central nervous system tumors and breast cancer.